People assume that my husband and I are constantly eating out. At the risk of disappointing people who may envy my perceived over-indulgent lifestyle, this just isn’t true. We eat out once – maybe twice – a week. I occasionally dine out during the week with girlfriends, or once and a while with my kids, but my dining out habits aren’t any more excessive than most people I know. I just happen to write about my experiences, so it seems that way. Another assumption is that we’re always shlepping to DC to dine. While it’s true that I don’t hesitate to head into the district for a restaurant, I am just as happy staying put in suburbia if there an interesting restaurant that holds my attention. Enter Urban Butcher – which opened a little over a week ago in downtown…Silver Spring. When I learn about Urban Butcher on Twitter, I assume that it is totally meat-centric. I am wrong. 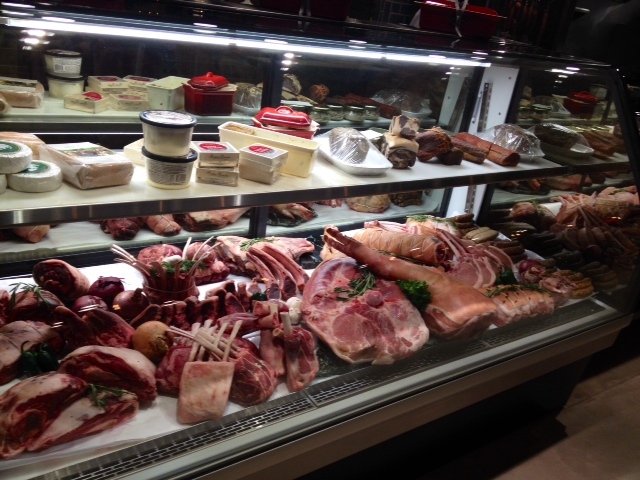 Urban Butcher features an impressive meat-counter and lots of meaty options, and but this is just part of the equation. There is also a lounge, a communal dining area, a bar, and a full-out restaurant with a number of delectable dishes for the non-meat-eater. From the press release: Urban Butcher, a bohemian inspired gathering place that celebrates the butcher’s art and nose to tail dining, will transform downtown Silver Spring later this year. Urban Butcher is a laid-back and relaxed escape from the ordinary. Every element of the restaurant from the sharing menu to the garage door sized windows that create an open air market feel to the repurposed coffee bar/lounge furniture to the custom-designed glass-enclosed curing cellar to the in-house butchering kitchen creates a true atmosphere of community, inclusion, transparency and comfort unlike any other. Just to be safe on my first visit (I guarantee there will be more), I bring along a carnivorous friend. I know that she will join me in over-ordering, so that we can sample as much of the menu as possible. A server greets us, asking if we’ve been here before. The restaurant has been open less than one week, so this amuses us. On the other hand, if she’s getting yeses, it’s a very good sign. She is well-meaning, but a little clueless about some of the menu offerings. We give her the benefit of the doubt, since its a brand new restaurant, but I can’t help but hope she will take some time to study up. (Rose’s Luxury, you have spoiled me with your posse of knowledgeable, food-loving staff). All is forgiven once the food begins to arrive. Burrata and calabrese peppers come with satisfying slices of crusty toasted bread. Although we run out of bread before the creamy burrata is gone, we can’t let any of it go to waste, scooping up the remaining bits as best we can. 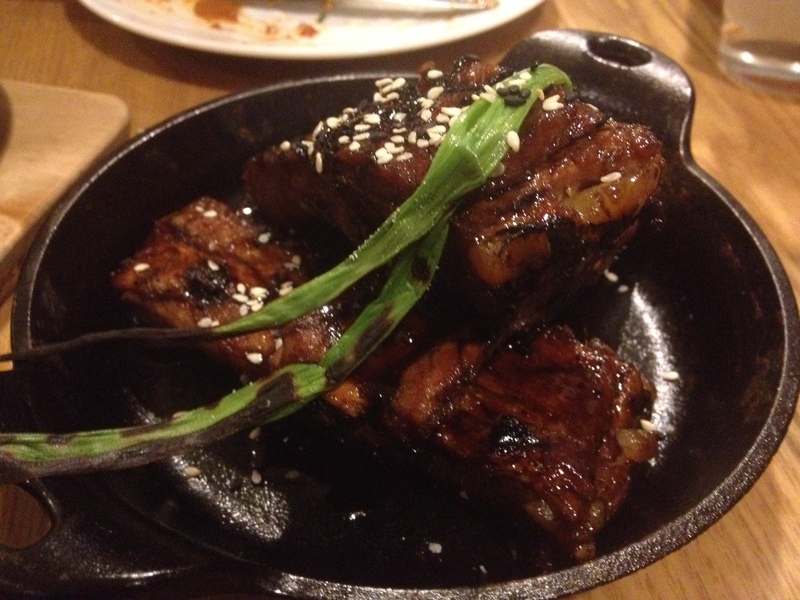 Chinese barbecued spare ribs arrive glistening with a thin layer of sauce. They are charred on the outside, perfectly tender, with a wonderfully slightly sweet and spicy sauce. When I hear a party at the next table debating whether to skip the ribs, I have to intervene. They are a must, I tell them. They thank me later. Ratatouille au gratin is a pleasant twist on traditional ratatouille. I expect tomatoes and eggplant to make an appearance, but the kalamata olives and a crispy layer of bread crumbs and cheese make for a unique, and far superior version than I’ve had before. I make a mental note to use this dish as an enticement for future vegetarian dining companions. Brussels sprouts with soy butter and garlic are good, although not memorable. But let’s get back to the meat. What is memorable at Urban Butcher is lamb saddle with Ethiopian “berbere” spices and red lentil ragout. The flavors sneak up on me. 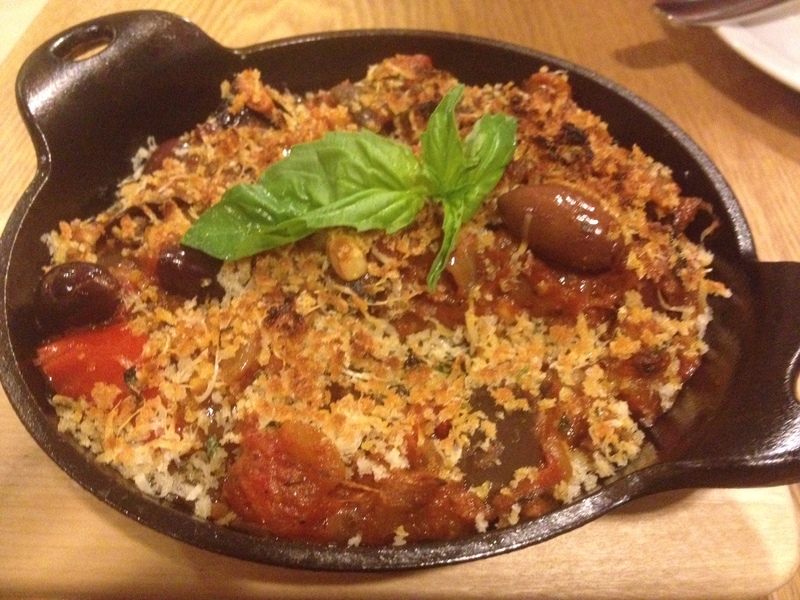 It’s a hot dish dotted with bits of apricot and marcona almonds to cut into the head and add texture. Its fantastic, despite the meat being extremely fatty. When we express some dismay that the fat outweighs the lamb, our server passes the message along to owner/chef Raynold Mendizabol. She returns to tells us this is an intended consequence of the cut of meat. Duly noted. The flavors win me over, and I would order this dish again in a heartbeat. Urban Butcher’s meat offerings continue with beef empanadas, crispy pig tails, and a whole suckling pig. I’m also tempted by butter barbecued and slightly smoked chicken. All meats are butchered in house, and many are cured in the restaurant’s aging room. I need to corral a few more meat eaters for a future visit if I want to tackle more of the meatier options. One might assume that the dessert options in a meat-centric restaurant are an afterthought. The truth is, Chef Mendizabal clearly gave a great deal of thought to what comes after the main events. Should we get chocolate soufflé with goat cheese gelato? Churros with orange-cocoa? Bacon maple gelato??? 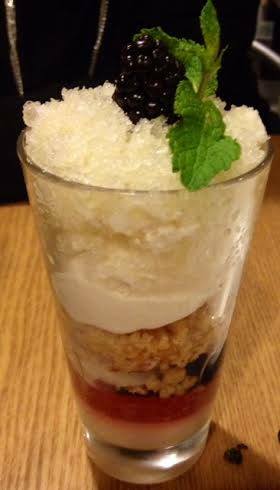 We can’t decide, but finally settle on blackberries and lychee cobbler with vanilla ice cream. It is light and refreshing, and ends up being a perfect palate-pleaser to the lingering spices. Now that Silver Spring has a unique dining destination with offerings to suit a panoply of culinary desires, I may be able to do a better job in living up to my reputation. If that means some extra visits to Urban Butcher, then so be it.